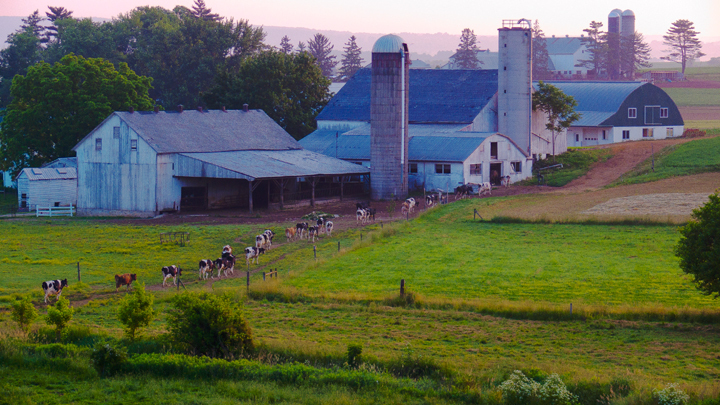 The tranquility of an Amish farmer leading his cows into a barn to be milked on a dewy early morn is undeniable. It prompts one to think: why isn't my life as simple and tranquil, healthy and fulfilling? One way to answer that question is to consider the differences between closed and open systems. Systems, of course, are disparate parts working together. One's tongue, teeth, stomach, gall bladder, and colon are all parts of one's digestive system, a collection of parts that work together to accomplish extraction of energy and nutrients from food and elimination of waste from our bodies. A living organism, such as a cow, is a system. A family farm can be a system. A city can be a system. A whole country can be a system. Systems are open when they exchange things with other systems and with their environment. Closed systems function largely without external exchange. North Korea is, in large part, a closed system. South Korea is very much an open system. Closed systems can be comforting to contemplate for their relative simplicity and reliability. One part breaks down and you pretty much know what's wrong and how to fix it. The Amish farm pictured above is like that. It's largely self-sufficient, needing little from communities beyond its immediate neighbors. Open systems are harder to understand and therefore harder to fix if things go wrong. But on the other hand, they can be more flexible and have an easier time adjusting to stresses and breakdowns. The U.S. financial system is such a system. It's problems since 2008 have been hard to fix, but it has survived and adjusted to many of the stresses brought on by its near collapse. Anytime open systems exchange things with other open systems, there is risk. There is risk because open systems are not dependent upon one another in the same way that Amish farmer pictured above is dependent upon his cows just as his cows are dependent upon him. Each part of that farm tenderly cares for the other because each knows their life depends on getting along and cooperating with one another. That kind of watching out for the other guy is not guaranteed within unregulated open markets. Take, for instance, this week's collapsed building in Bangladesh. Engineers, builders, owners, tenants, and workers each had their own sets of priorities in a string of market transactions that left responsibility for the sustained welfare of the other guy completely out of the transaction. Instead, each attempted to satisfy their own narrow priorities, money in hand, while those on down the line lost their lives in a crushing failure of responsible caring. Similar short-sightedness was seen in China last year when baby formula was adulterated with unhealthy chemicals in an effort to increase profits, and in the U.S. where the coal, oil, and chemical industries have for years fought regulation forcing them to clean up the deleterious health and environmental consequences of their business activities. Such lapses in social responsibility take place daily across our planet wherever open systems interact outside a framework of legal accountability. Nearly every citizen on the planet accepts that sports and games need rules and referees to make sure play is fair and safe for all participants. Why should we object to agencies of government devising rules, refereeing, and regulating our exchanges with other open systems? One reason we might object is fear that government intervention could facilitate creation of an even larger rigidly closed system from all our many disparate open systems, as has happened many times throughout history with the establishment of harsh dictatorships. But that's the extreme. Something less extreme can and does happen with much greater frequency. Consider the case of independent boxers joining together as a fight club for purposes of enjoying the predictability of fighting with one another under a fixed set of rules. Similarly, business associations, labor unions, and international treaties bring disparate open systems together under a common set of rules that help create a larger more predictable though less open system. Temporary peace of mind often results, but longterm inflexible rigidity can also result as more and more rules are piled on, potentially crippling system innovation and inviting hamstrung vulnerability to comprehensive system collapse just like that building in Bangladesh. So, what is the right balance between no regulation and stiflingly too much regulation? That's a question we need to keep asking ourselves, continuously readjusting our relationships so that innovation is not stifled yet social irresponsibility and corruption are vigilantly held at bay. That isn't a simple proposition. And it isn't especially tranquil. But, in the long run, it appears to be the most healthy course we can take. In the meantime, try appreciating and contributing to the community you find yourself in. There is stress easing rejuvenating comfort to be found as an engaged member of one's local community, caring for and being cared for by those around you. Just like on that tranquil Amish farm pictured above.